The Italian in me just wants to make the simplest food. It doesn’t want to be fussy. It doesn’t want spend hours cutting things just so or mixing 25 ingredients into a salad dressing. My Italian side also pretty much just wants to make gnocchi and tomato sauce all day, which, though delicious, would not make for the most interesting blog. Fortunately, I have fallen deeply in love with Middle Eastern food. The rich flavors, the complex spice mixes, the vegetable forward way of eating. The more I cook like this, the more I realize that the Italian way of eating simple food, not doing too much to it, that totally unfussy way of cooking seems to fit right in. It’s actually been kind of exciting to me, to try new spices and spice blends and treat them to the ways I’ve always cooked food. This salad is a great example. I love squash, and roasting it up with red onions and tossing it with some greens and nuts in a simple vinaigrette is something that I would always do. But in this Middle Eastern update, I toss the onions in pomegranate molasses before roasting them, and add fresh pomegranate on top. I toss everything together with some salt and lemon and za’atar, an amazing spice blend of oregano, cumin and sesame seeds, that you can buy already blended and ready to go. Then I put a bowl of garlicky yoghurt on the side to dip the salad in. The result is something so much more complex and rich than I would have ever made before, but is still incredibly simple and easy to do. Small miracles friends. They do happen. Peel the squash- butternut squash can be peeled with a peeler, the kombucha squash will need to be done with a knife and some patience. Be careful! Cut the squash in half and scoop out the seeds. Wash the seeds and toss them with some salt and a good glug of olive oil. Put them on a tray and bake for about 20 mintues, stirring every 5 mintues. Cut the squash into ½ inch wedges and lay them out on a baking tray. Toss with a good glug of olive oil and a healthy pinch of salt. Bake for about 45 minutes, or until the squash is fully cooked. Peel the red onion and cut it in half. 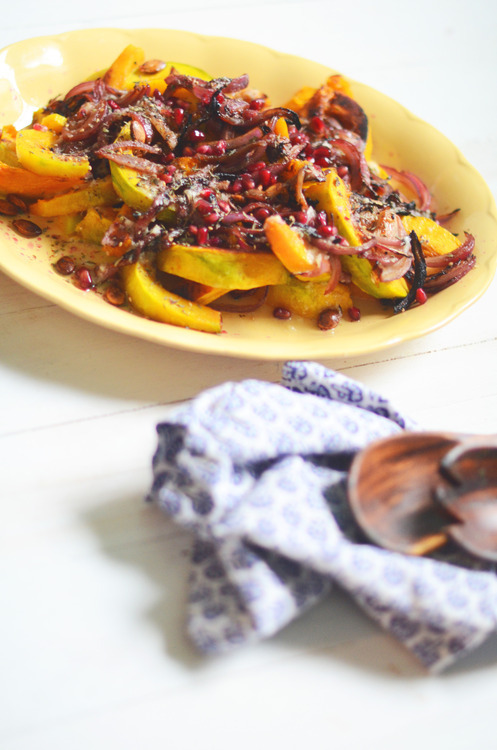 Cut into thin strips and toss with salt and the pomegranate molasses. Put them on a baking tray and roast them for about 20 minutes, or until they are soft and a little bit caramelized. Smash up the garlic as small as you possible can. Mix it with the yoghurt, salt and lemon juice. When the squash are still warm sqeeze the lemon juice on top and toss to mix. Check your seasoning and add some salt if you need. Put the squash on a platter. 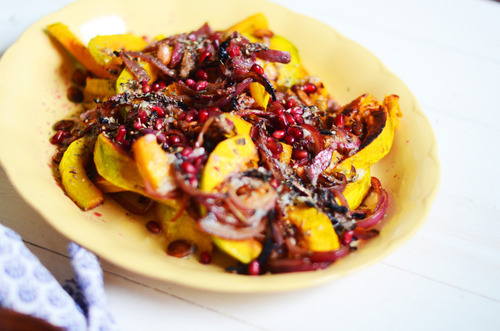 Top with the onions and roasted squash seeds, and break apart the pomegranate and sprinkle the seeds on top.